Guinevere has had nasty eczema practically since the day she came out of the womb. It was so bad last year that we took her to the emergency room a just a couple days before her first birthday because it turned into a horrible rash that she scratched to the point where it got infected with impetigo. The nurse hotline was worried that it might be measles or chicken pox, so they sent us to the ER. There is nothing more terrifying than having a nurse tell you to wake your sleeping 11 month old and take her to the ER – especially when you had just been expecting them to tell you to make an appointment with the pediatrician the next day. There we sat with our adorable child who had nothing wrong with her other than a nasty rash, surrounded by adults who were truly sick. It was not a fun experience! The saving grace is that out of all of it, we got a prescription for a steroid ointment that seems to really keep the eczema at bay. The downside is that it’s a steroid, and so you don’t want to have to be applying it to your kid daily. For the past year, our treatment for the eczema consists of not bathing her every day, applying lotion every day and applying the steroid ointment only when she gets a bad flare up. So far, it’s working pretty well, but I’m always on the lookout for other solutions. 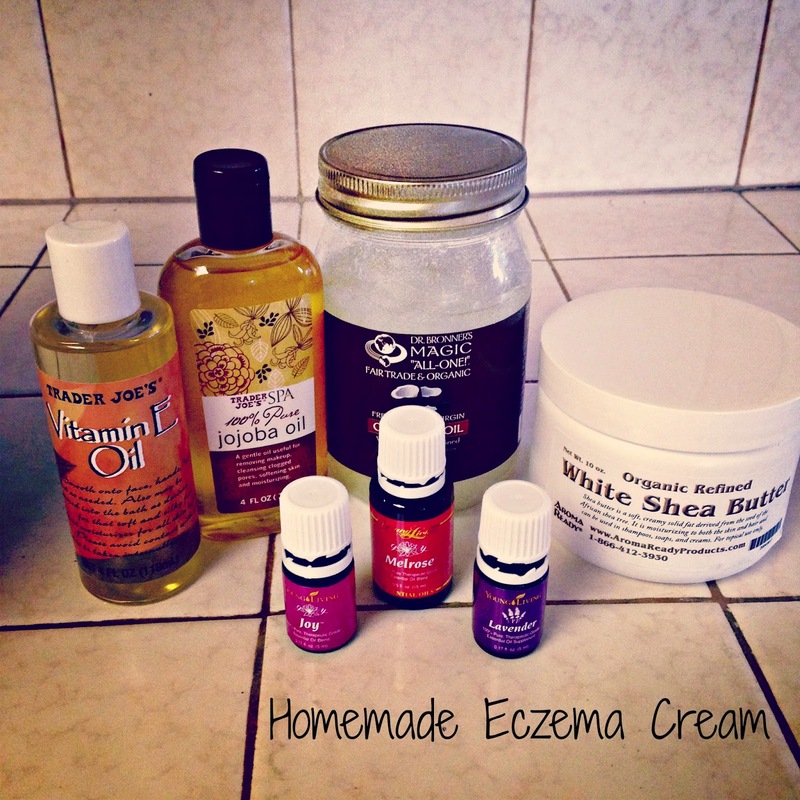 When a dancer friend of mine posted on facebook that she made a homemade eczema cream for her kids and showed before and after pictures, I knew I had to have the recipe. My friend uses Young Living oils and sent me the recipe (see below for the full recipe) along with a bunch of other information about Young Living and other essential oils. She added me to a facebook group where people can ask questions and share knowledge about various uses for essential oils. I honestly had no idea there were so many uses for oils! I knew you could make your own lotions, scrubs, soaps and cleaning supplies. It never occurred to me to diffuse the oils to help with allergies or colds, or to gargle with some of them to get rid of a scratchy throat (it works!). There were a few things holding me back from making the purchase: 1) These oils are not cheap. I knew essential oils were expensive, but these are more expensive than your standard health food store oils. Young Living’s reasoning for the price difference is that their oils are pure, whereas many health food store oils are diluted, chemically altered, or otherwise “unpure.” They own their own farm land, so they control every aspect of the process from the moment the seeds are planted in the soil, to the point where the bottles are shipped to you. Because the oils are pure, they are also more potent than health food store oils, so you don't need to use as much of them, which makes them more affordable in the long run (just a rather large up front cost). Seriously, you only need a drop or two of oils for diffusing purposes! 2) The eczema recipe called for lavender. I have had issues in the past with lavender. It can make me itchy, which is the exact opposite response desired for an eczema cream. I have no idea if lavender makes Guinevere itchy, but I figured since it makes me itchy, I didn’t want to risk it on my child who can’t tell me if something affects her (though she has now started saying the word, “itchy”). However, I decided to give YL’s lavender a try for the same reasons that it is more expensive than other lavender oils – it’s reportedly “pure.” Most other lavender oils have extras added in to defray the cost, but it could be those extras that made me itchy, and not the lavender itself. After reading a bunch of testimonials of people who also had bad reactions to other lavenders, but not YL's lavender, I decided to risk it and test it out. I am happy to report that YL's lavender does not make me itchy at all, which makes it worth the extra cost! 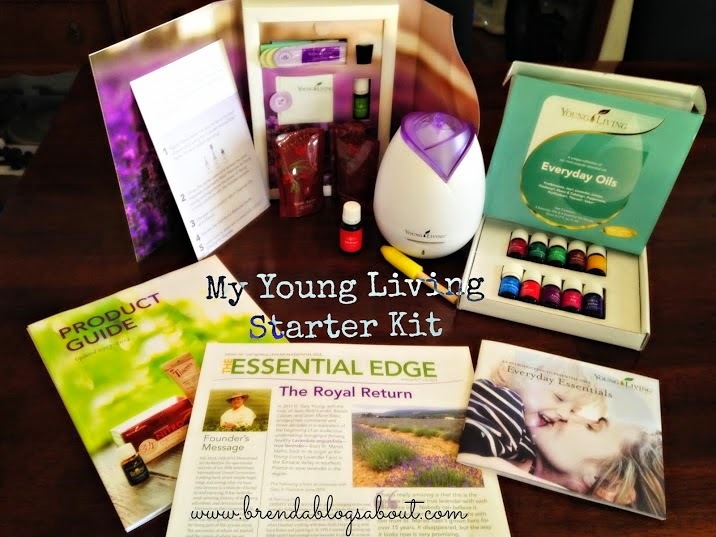 I did a bunch of research and ultimately ended up purchasing the Young Living starter kit. I bought the kit instead of just the 3 oils needed for the eczema treatment because the kit is a much better deal for your money and I wanted to experiment with other oils. There’s a combination of three other oils that supposedly works wonders for seasonal allergies, so the next time Aaron’s allergies act up, I have something I can give him to try. The kit includes 10 daily essential oils (a combination of single oils and YL’s proprietary blends): Frankincense, Lavender, Lemon, Peppermint, Joy, PanAway, Peace & Calming, Purification, Thieves, and Valor. It also came with a blend called Stress Away, some samples of a drink they make called Ningxia Red, and a home diffuser. It was the diffuser that put me over the edge on ordering the kit as opposed to just getting the oils, since the diffuser on its own is expensive, and just getting the three oils needed for the eczema cream, plus the diffuser would have been close to the price of the kit anyway. I’ve been slowly going through all the different oils and diffusing them in the house and taking notes on how they smell, if they have any effect, and which I like best. So far, I like the Stress Away blend the best. It smells delicious and the night I diffused it, both kids were super well behaved the entire evening! It could have been a complete coincidence, but I’ll go ahead and attribute it to the oil, if nothing else, to feel like I got my money’s worth. They also have a blend called Thieves, which reportedly has antibacterial properties. I felt the scratchy throat you often get when a cold is coming on. With the baby and the toddler in the house, I don't have time to get a cold, so I gargled a glass of water with 1 drop of Thieves and amazingly felt fine the next morning! When you buy a kit from Young Living, you also sign up as a “distributor,” which means I get to buy the oils at wholesale prices as opposed to retail. In theory, I can sell the oils to you or your friends . . . or I can just share my discount and we can split the cost of shipping (which might almost be preferable - stupid Amazon Prime, getting me used to not paying for shipping!). Full disclosure: YL is a multi-level marketing company, so if you ever do buy a kit and were referred by me, I get a referral fee. Blend all together in a food processor or blender for 5 minutes. Since it was stupid hot the day I made mine and the coconut oil had completely melted, I poured the mixture into tubs and then put it in the fridge until an hour before I needed to use it. You don’t need to keep it in the fridge for a long time, just enough to let it set – and that’s only on stupid hot days. I’m sure if I made this recipe in the winter, I wouldn’t even need that step. I want to play with the recipe a little to find exactly the right formulation for G’s skin. It’s definitely not going to eliminate the need for the steroid cream. That stuff clears up any flare-ups overnight! However, this cream does seem to help in between flare-ups. And I'm not freaked out when G insists on applying a little herself. Since the ingredients are all natural, it's ok for her to put her hands in the tub and put it wherever she wants. If you are interested in any of these oils or the kit or anything else, let me know and I’ll send you whatever info you need. Wow you sound like a total pro already! I completely agree with this. Thanks! Essential oils are made to serve numerous health benefits. The oils help in soothing the body as well as massage is done with the help of the essential oils. Today, essential oils are used in a wide range of array and in many places people use fragrance oil in soap. I've been looking for an effective eczema treatment treatment forever, so here's to hoping I've finally found it right here! I'll have to head to the store to get a few of these ingredients first though. General recommendations for all of course are good. But it is important for me to follow personal style, even with the use of essential oils.